Hey folks, hope you all had a nice Christmas. I slept through midnight mass, I couldn't rally to get out the door, Tim went without me though. I also decided when I went to bed that I would sleep through Christmas since it was just Tim and I this year and we didn't really have anything special planned PLUS I have been sad, depressed, homesick, etc. I only made it until about 11:30 AM though. I woke up and the top half of the Christmas tree had burned out or the fuse blew, if that was any indication of the day ahead, I wanted to go back to bed. So I slept for another half hour or so and then Tim woke me up and told me Santa left something for me under the tree. 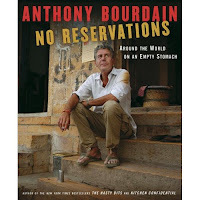 He brought me the companion book to the TV Show "No Reservations" (Anthony Bordain), which I love. I was completely surprised because he remembered that I mentioned wanting it one day when we were at the store. I also felt bad, because we had decided not to buy each other stuff for Christmas since money is way too tight right now. It was very sweet though and made the day a little bit better. The rest of day we just hung out at home, I tinkered around with my sewing machine and made a big pot of spaghetti. We watched "Home Alone" in the evening and then went to bed. Back to work today as if it were not even Christmas, kind of sad. Next year should be better (I hope).